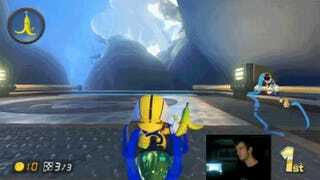 It took me a minute to realize what the Twitch streamer and frighteningly good Mario Kart 8 player xLunairex was doing with his banana peel. But once I did, I was very impressed. You might have to watch it more than once if you’ve let your Mario Kart 8 skills get rusty over the past few months. Essentially xLunairex used his banana peel to stall the driver directly behind him whilst also making sure the collision left the opponent in front of him. That (or backing up at just the right moment) is pretty much the ultimate form of blue shell dodging/trickery. It definitely beats out the “super horn blast right before the finish line” in terms of Mario Kart 8 troll moves. Let’s all take some lessons from the xLunairex-es among us as we prepare for the new Mario Kart 8 DLC, which is finally coming out this week. Is anyone else excited for Cheese Land?!?! Watch more of xLunairex’s rad Mario Kart 8 plays on his Twitch channel.